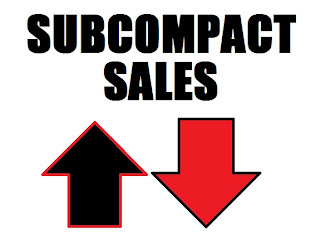 I should start out by saying that I missed doing October's subcompact sales, so you'll have to forgive me. Sometimes life gets int he way of blogging. Now that we've gotten that out of the way, November was a great month for overall auto sales, and several models showed nice double-digit gains in November. The big winner was the Kia Soul, posting up a gain of more than 77%. In a distant second was the Hyundai Accent, followed by the Smart For Two. The big loser this month was the Mazda2, which was down 71% vs. Nov. of '12. Also in the not-so-prestigious down-more-than-60% club are the Toyota Yaris, Scion iQ, and Nissan Cube. If you've followed previous months' sales, you probably aren't surprised. I'm not. But hey, enough chit chat; onto the big board.